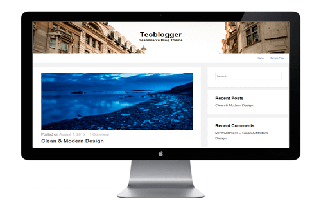 Tecblogger Responsive Blog Theme for WordPress. This theme is perfect choice for your personal , niche , corporate , marketing or authority blog. Tecblogger Responsive Blog Theme for WordPress. This theme is perfect choice for your personal blog, niche blog, corporate blog, marketing blog, authority blog or any type of creative blog. Built by the latest twitter bootstrap & font-awesome and it also supports different types of post format. Tecblogger Blog Theme is designed with flexible color to customize by yourself. So, you would be able to choose whatever color that you like. Tecblogger Responsive Blog theme is developed using Bootstrap 3 frontend framework which makes it fully responsive and optimized for all mobile devices such as iPad, iPhone, Android and Windows Phone. Contact Form 7 – easily receive emails from your site visitors. This plugin features captcha and spam filters. The best solution for either small contact forms or full-featured reservation modules. We used Google Fonts for easy and flexible setup of the theme typography. Choose free open-source fonts optimized for the web. In case you encountered any problems with our Theme do not hesitate to contact our support team. We would be glad to help with any issue related to the Theme. It’s not just words, we really help.